Course 1: Building Buttercream Skills: On Day 1, you will learn a broad set of buttercream decorating techniques using The Wilton Method® and develop skills you can use for all your decorating projects, from cupcakes to cakes for any special occasion. Course 2: Flowers and Cake Design: Here you will learn to work with royal icing as well as get an introduction to using fondant and gum paste. 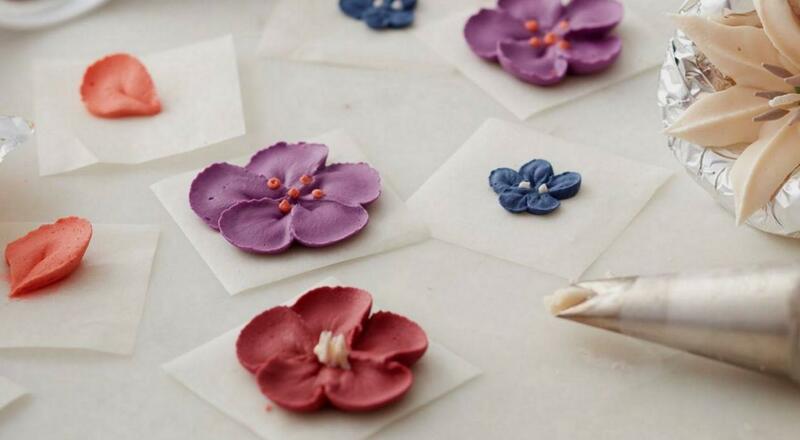 You will develop core skills to make many varieties of flowers, such as pansies, lilies and the Wilton Rose. Course 3: Gum Paste and Fondant: In Course 3, you will develop new skills working with fondant and gum paste and apply them to create shapes, borders, flowers, and much more. Course 4: Advanced Gum Paste Flowers: This final course teaches you advanced techniques for working with gum paste to make realistic flowers. The flowers and arrangements you create with these skills will be the perfect addition to any cake, cupcake or party table. Five packed days covers buttercream piping, royal icing, fondant and gumpaste flowers! And because learning on a full tank is always better, there will be nibbles and drinks available all day, in addition, a veg lunch will be served!